Sole proprietor, sometimes hire a helper to wrap soaps before an event. Handmade soaps from organic & natural ingredients (over 70% organic) with only steamed essential oils, vegan, herbs, clays & minerals for colorants. After having been chopping spices and marketing Chai in Santa Cruz for 16 years, R. Garimo Pape decided they needed something new to do. 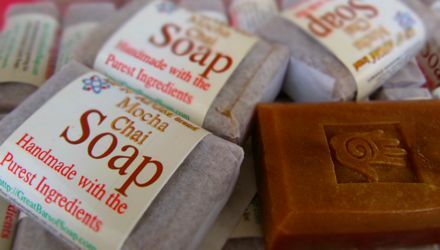 So in 2007 he took some soap making classes at Nova Studio and started making good quality soaps. He travels around the bay area selling at summer street fairs and from their website. Bulk oils come from Bridgewell Resources. Organic Extra Virgin Olive Oil, Organic Coconut Oil, Organic Palm Oil, and some Organic teas & herbs from Monterey Bay Spice Co. The more bars of soap purchased the less the cost per bar. Bulk bars that have no printed labels and "Good Basic Bars" that are blends made from recooking the trimmings are sold for a cheaper price.